Tokyo-based designer Kosuke Araki has created a range of tableware from recycled food waste. The Anima collection features a series of cups, plates and bowls, which Araki made by combining carbonised vegetable waste and "animal glue", from the bones and skin of animal offcuts. Araki designed the collection to demonstrate the alternatives to throwing away food waste, which is often disposed of in landfills. "Every day, food waste is produced at a huge industrial scale, as well as a small domestic scale," said Araki. "Although some of it is processed into something useful, most is disposed of in landfills contributing to environmental problems," he explained. To create the items Araki collected and recorded the amount of non-ediblefood waste – including rind, peel, calyxes, shells and bones – produced in his house for two years. The total amount weighed 315 kilograms. He burnt the vegetable waste until it became charcoal, and boiled the animal bones and skin into a glueing agent to mould the charcoal into shape. 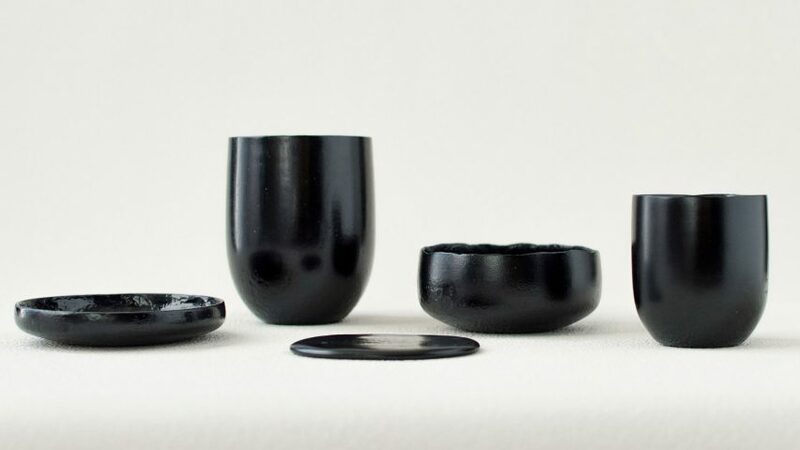 Finally, a thick layer of urushi, a type of Japanese black lacquer, was used to coat the products. "[This] gives not only practical strength but also depth and a polish," said Araki. "Urushi craft historically has a close relationship with food leftovers of a meal," he said. "For example, rice, tofu or albumen is mixed with urushi to adjust its viscosity for making sticky glue." Several designers are now taking to using unusual materials in their products. Examples include Roza Janusz who made an alternative to plastic food packaging, using a combination of bacteria and yeast, while a team of UK scientists have developed a biodegradable construction material made from desert sand.